I was fortunate enough to get up to Pittsburg for a couple days with Colby and his buddy Justin. We stayed up at Justin's cabin and got a lot of fishing done so this post will be very picture heavy. Before I go on with the report, I would like to thank Justin for inviting me up to his camp and showing me all his secret spots (don't worry, the secret's safe with me ;) ) and my parents for letting me go. This is a fairly small report since we arrived at camp around 8 p.m. 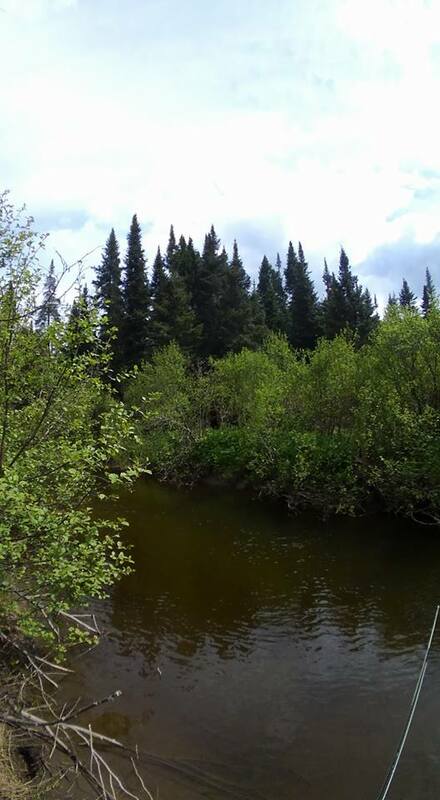 There is a small, stocked brook flowing through the backyard that also has a fairly substantial population of natives so we took a short walk downstream and went to work! At first glance, the pool wasn't much to look at. Many of the pools were shallow, clear, and sandy and looked generally devoid of fish. I started to prospect further downstream and found some slightly faster water. Although this water wasn't much deeper, it was loaded with fish! I stuck with a tight line technique and landed 4 fish and lost almost twice as many in just 1 hour! The bites were super subtle and I missed many fish since I didn't set the hook as hard, thinking I was hung up on the bottom instead of on fish. It was amazing to see how well camouflaged these fish were since a flash would seem to appear out of nowhere. Once it started to get dark, I made my way back. Turns out we weren't alone! 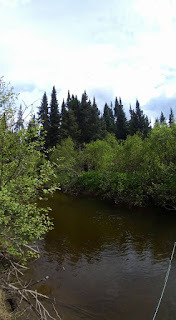 There were moose tracks and deer tracks everywhere along the riverbank. This was certainly a grim sight. From the way the bones were sprawled, it seemed like it got attacked by coyotes and put up quite a struggle. Plus, there was so much moose fur on the ground, I grabbed a couple bunches for the tying kit :). Once we got there, the fishing made the tough travel completely worth it. At first, the day started off a little slow. Colby lost one his very first cast and Justin and I missed a few strikes. Afterwards, Justin hooked up and I hooked up. There was no rhyme and reason to the bite early on, the fish were hungry and attacking anything that looked alive. Colby fished a mix of dries and streamers and I stuck to chucking small streamers and wooly buggers all day. We lost count of the number of fish we caught but in total it was over 30! Many fell within the 6-12 in. range and we even caught a number of freshly stocked fingerlings, however, a few larger fish (like my 16 in. fish and a couple of 14 in. fish were also caught). Justin also missed one that had to be over 20 in.! One of Colby's many brookies! One of my brookies makes an appearance for the camera! After a few hours of fishing, we decided to head back to the camp for lunch. After Justin dozed off for a quick power nap, Colby and I headed to the trophy section of the Connecticut to try and get some larger trout. Unfortunately, my maiden voyage to this section resulted in one large goose egg. The only people I saw hooking any fish were next to the bridge on Carr Road. I heard they stocked that section pretty well so it made sense but the fishing was difficult from what I saw or heard. One angler reported spending a few hours to catch one brookie (albeit a 4+ lb breeder!). A couple of local anglers I talked to said that the section had been hit hard all day which may explain why the fish were so tightlipped, likely having been caught earlier that day. From what I'd heard of lights out action and large fish, needless to say I was very disappointed/ dejected but decided that I would come back at some point and spend hours learning that river since ultimately, time on the river translates to improved success. We wrapped up in around 2 hours to hightail it back to camp and hit the brook. We fished an upstream section and despite the deeper water and pocket water nature of the river, I didn't have too much luck. I picked up a surprise salmon but that was it for action. Some might say it was completely worth it since the fish would have had to migrate miles upstream from the trophy section to even get there! Colby ruled the day with 8-9 brookies of good size skittering dries (dead drifting nymphs did not work great). Wanting to end the day on a good note, I went back to the backyard and caught 2 brookies and lost a few more on nymphs. Colby caught some more skittering dries (a technique that would come in handy the next day!). I anticipated packing up, leaving early in the afternoon, and hitting a white mountains stream on the way back but a quick walk outside changed my mind. The rain and cold of the previous day had disappeared, giving way to warmer, more pleasant weather. Plus, the river appeared to be alive today with mayflies and caddis popping off, sometimes sporadically, other times in clouds. The fish were also active as a brief trip to the backyard yielded a few takes and a couple landed! Colby called me in after about 15 mins., telling me that Justin was taking us to a spot downstream. After slight consideration, I followed along. On the way, we found a small feeder trib. under a culvert that immediately produced brookies for Colby and Justin. As Justin exclaimed, these fish were "about as native as they get." Without squinting hard enough, you would not notice this stream even if you drove by it a hundred times. That is the epitome of the north country, blue lines teeming with little native gems. We continued on further to our planned spot but I was somewhat disappointed with what I saw. The water was flat but deep with overhanging branches, not at all conducive to nymphing. It basically looked like the Squannacook and Nissitissit rivers, deep holding pools punctuated by short stretches of riffles. 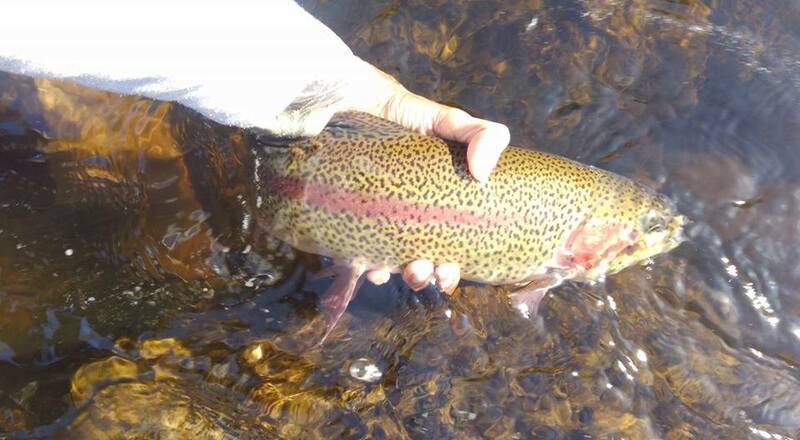 I switched over to an elk hair caddis but didn't see any fish rising early on so I switched to a wet fly. Within minutes of switching, I spotted a first rise! I casted slightly upstream of that fish, let the fly swing, and within seconds, I felt a tug and pulled out a nice little native! That was more like it! After a couple of short strikes and a few refusals, I switched up to a full fledged dry (EHC) and action once again resumed. I caught and lost a couple of fish immediately and even broke off a nice one (frayed tippet)! It almost did not matter what I did, dead drifting and skittering worked equally well. When one technique wasn't working, the other produced. This is truly God's country and I am blessed with the opportunity to visit this land and share in its bounty. I stopped by the culvert for a few more minutes and landed a couple more brookies. They are small but man are they beautiful! Back at camp, I took a few more casts in the backyard after I finished packing and picked up 3 more brookies. One on a big bushy dry (sorry, not much of a dry fly fisher so don't know the name of it) and a couple more on pheasant tail nymphs. All in all, it was a great vacation and a great experience spending a couple days in the north country. Not often that I get to experience trout fishing this good living in the southern part of the state. Colby and Justin, if you have any more photos, feel free to add another post!